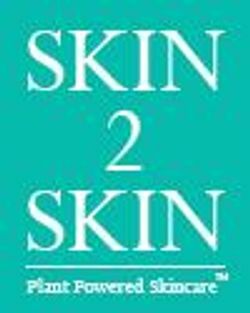 “Skin 2 Skin Awarded Top Five Products; Skin 2 Skin’s Anti-Sagging Renewal Serum best sagging serum and 24/7 Rejuvenation Cream best anti-aging with natural vitamin C products given top designation for their effective skin results. AB-HA Exfoliating Cleanser is a deep cleansing exfoliator includes the Alpha Hydroxy and Beta Hydroxy Acids of Glycolic, Salicylic and Lactic. These natural acids loosen the bond of dead skin cells to accelerate the natural skin renewal process. Assistis in reducing breakouts, fine lines, wrinkles, and other signs of premature aging from the sun. Jojoba beads exfoliate the skin to prevent occlusion of pores, revealing fresher and more youthful glowing skin. Skin is soft, smooth and hydrated after use. For all skin types; use two to three times a week and gentle enough to be used once a day depending on skin type. For use on face, neck, decolletage, shoulders and hands. Use with Skin 2 Skin’s White Tea Face Wash on alternating days. Benefits: This unique masque incorporates a special active Papaya Enzyme in a rich creamy masque to re-texture, renew and smooth the surface of the skin. Avocado oil is an anti-oxidant, rich in vitamin E moisturizes and hydrates to soften parched skin. Tapioca Starch and Kaolin clay tighten the surface of the skin to clarify and condition. Extracts of Pumpkin Seed and Comfrey have clarifying and therapeutic properties. Japanese Green Tea acts as an anti-oxidant to reduce redness and irritation. Gentle enough to be used two to three times a week. Skin 2 Skin® Un-Wrinkle Forehead & Crow’s-Feet booster cream is designed with 2 advanced Neruopeptides Argireline, Acetyl Hexapeptide-3 and Snap 8, Aceytl Glutamy Heptapeptide-1 at maximum concentrations targeting expression lines without toxic injections (No Injections Needed). Studies have shown that the peptides reduce expression lines appearance up to 63% with AM and PM application. With the peptide ChroNOLine and Superox-C (Kakadu plum extract world’s highest source of Vitamin C at maximum concentration) giving you long term reduction of fine lines, wrinkles and lip lines for a more smoother healthier and younger appearance. 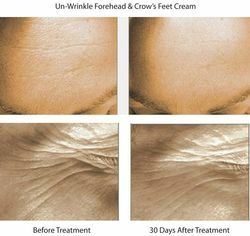 Skin 2 Skin’s Un-Wrinkle Forehead & Crow’s-Feet Cream is recommended by Allure Magazine and Skin Experts as one of the best ultra-effective topical alternative to Botulinum Toxin ( OnaBotulinumToxinA Botox) Injections. 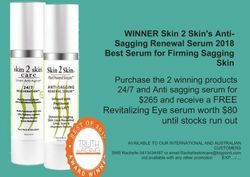 2017 Best Sagging Skin Serum is Skin 2 Skin’s Anti-Sagging Renewal Serum with Ultra-Lift PepStem4™ is a highly concentrated lifting serum creating accelerated younger appearance. The Green Tea Stem Cell is known as the “Fountain of Youth Stem Cell” for its powerful ability to renew the skins youthful appearance. Anti-Sagging Renewal Serum is a sophisticated and advanced skin nourishing ultra-lift and firming anti-aging booster serum that immediately improves the texture and feel of the skin. On application skin feels extraordinarily smooth, soft and moisturized. 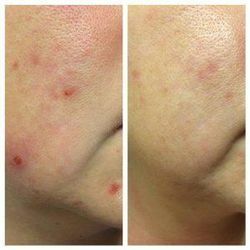 Give your skin the boost it needs to treat sagging, drooping/slaking skin, lip and nasal labial lines and improve the appearance of new and old scars. Makeup glides on with Skin 2 Skin’s skin wellness products and helps keep it in place. Skin 2 Skin anti-aging moisturizers isn’t just a treatment – it’s an experience in indulging in one of our ultra-active hydrating, skin-smoothing face creams made for day-to-night, the ultimate skin transformation. “With this unique cocktail of ingredients that target various aspects of skin aging, I am hard pressed to think of what else I could possibly want in a daily cream. The Aging Intervention Cream refreshes the skin as soon as it is applied and, because of this, it feels especially wonderful applied after a shower. It leaves the skin moisturized for hours and with no tacky or oily residue. It is truly a treat to use. I highly recommend this cream.”Sophie Y. Every day, your skin faces damaging environmental stressors accelerating skin aging. Skin 2 Skin® created Aging Intervention Cream to neutralize accelerated skin aging at every age and bring the skin back to a healthy youthful glowing appearance. 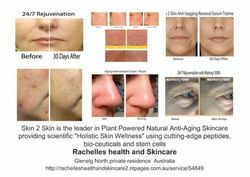 With 33 anti-oxidants including the universal anti-oxidant Alpha Lipoic Acid, natural plant Retinol alternative, tetrapeptide-3, toners, Kakadu Plum extract the worlds richest sources of Vitamin C, 200 essential skin nutritional elements, hydrators and moisturizers, guards the skin from invisible heat aging, reducing all fine lines, wrinkles, scars and pores. Skin will instantly feel replenished, softer, smoother leaving a supple healthy glowing youthful looking complexion. 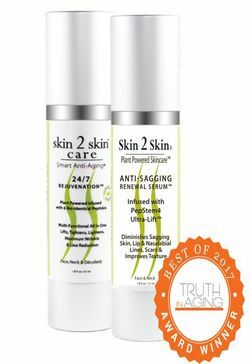 Skin 2 Skin®, 24/7 Rejuvenation, awarded 2017 The Best Anti-Aging Product by Truth in Aging and Best Vegan Anti-Aging Beauty Product awarded from Vegan Health & Fitness. “I have to say, that after using Photoaging Repair for 30 days, my décolleté is literally transformed. The medium to deep lines are visibly diminished, sun spots have virtually disappeared and there’s an overall radiance that I haven’t seen for years. I’m beyond impressed! !” Michele Sorro, CA. 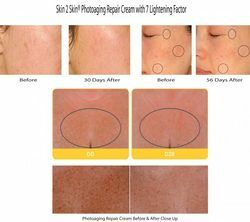 This award winning is an advanced skin lightener, dark spot and discoloration corrector is infused with S2S 7L Complex, a proprietary blend of active ingredients working synergistically on multiple levels to address all stages of skin discoloration. Highly concentrated formulation was designed to target and diminish the appearance of dark spots and all types of discoloration of the skin for a more even skin tone, while helping to inhibit the reappearance of dark spots, discoloration and combat fine lines and wrinkles. Visibly improves the skin’s appearance for a healthier youthful complexion. 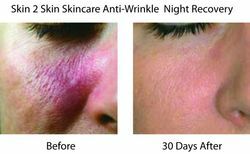 Introducing our new improved Award Winning Anti-Wrinkle Night Recovery not only designed to help the skin recover at night from daily environmental stress aging as a PM cream it now renews dry flaky sensitive skin as a AM and PM moisturizer. An advanced plant powered anti-aging formulations, with 7 high performance actives, 32 anti-oxidants including super anti-oxidant EUK 134 (Eukarion-134), S2S Nutrition Complex, redness and sensitive skin regulators. Designed to keep your skin looking healthy, beautiful and younger and you feeling exceptional about how your skin looks. Dry and Sensitive Skin Benefits: S2S HITS™ (Hydrating Infusion Therapy System) includes ultra-hydrating WildPlum Harvest™, Australian super-fruits Kakadu Plum, Illawarra Plum and Burdekin Plum improving the skin hydration up to 60% in 30 minutes, 128% in 30 days and long term. Rose Hip Oil full of vitamins, antioxidants and essential fatty acids that repairs the skin’s surface, hydrate day, itchy skin, reducing scars, fine lines and corrects dark spots. With Gatuline® Drema Sensitive to get the red out, brings peace and serenity to hypersensitive and reactive skin, and inhibits irritation, swelling and accelerated skin aging. For external use only, if irritation or rash develops discontinue use. Keep this and all cosmetics away from children.